LIVE is back. A scratch night curated by Barrel Organ; presenting experimental and non-traditional work that specifically acknowledges the presence of the audience and plays with the ‘liveness’ of theatre. 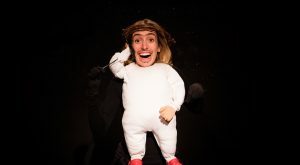 Expect a night of bold, experimental and uncompromising work that tackles a wide range of issues, agendas and ideas, as well as other pieces presented in the foyer and audience feedback like you’ve not seen it before. 5 audience members are invited on stage to act out a text when we all know they definitely don’t fit the character requirements. A ‘live’ character is made in London by an ‘online’ character in Barcelona. A solo show exploring ageing and acceptance of death through the world of life extension. A series of conversations about control, cultural cannibalism, and why we can’t look away. A multimedia performance about the sentimental value we ascribe to mundane objects, and socks. Pre-booking is highly recommended due to popular demand. LIVE4 is a pay-what-you-can event. All the artists you see performing are early career, and doing what they can to make ends meet. Your donations are directly split between the artists, so we do ask that you pay what you feel is fair. Please reserve your seat in advance via the website, or by calling the box office, and we ask for you to pay what you think is deserved at the end of the night and support these artists directly! Thank you. As a company, Barrel Organ try to make work that is self-consciously theatrical; plays with the unique ‘liveness’ that theatre offers as an artform; and continually seeks to explore and deconstruct the relationship between performer and spectator. LIVE was begun as a means of offering a space for artists, companies and makers, who don’t necessarily work solely with new-writing or traditional theatre forms, to test their work in front of an audience. 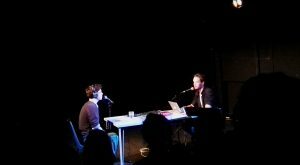 Previous LIVE evenings saw submissions for work from across the UK. 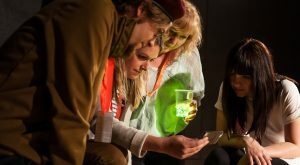 giving emerging, as well as more established, artists and companies space to test up to 20 minutes of material in front of an audience, and alongside work that Barrel Organ will be scratching. The LIVE night will be going on the road across the UK in November, seeking work form local artists and companies as Barrel Organ tour their show ‘Some People Talk About Violence’.